Besides having all the functionalities of the Centor Easy, the Centor Touch Star TT torque gauge with reaction torque sensor provides handy further possibilities: the graphic display shows the full graph Torque = C(t). This gives you a general overview of the current test. 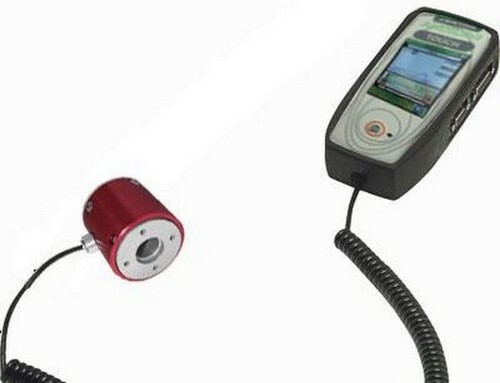 Mounted with a non removable external mini torque sensor, it allows you to measure very small torque with the high accuracy required. Mounted with a non removable external reaction torque sensor, it is the ideal torque gauge to integrate a torque sensor into your own test system. The torque gauge is able to make several types of calculations on demand (break point, first peak, average, torque at time T, etc.). It is equipped with a special sensor recognition system. This means that a single instrument can read different sensors (several capacities, Force or Torque). Furthermore, it is possible to freeze its configuration to avoid handling errors. It is the most versatile Its advanced measurement chain enables it to use a sampling rate of 5,000 Hertz with a resolution of 1/10,000 FS and a total error of less than 0.5% FS. The Set point functions can be used to carry out: PASS / FAILED tests: a symbol appears on the display. Application note: Reaction Torque Sensors do not rotate, they can only be used up to 360 degrees of rotation. Application range: fastener testing, engine testing for automotive and aerospace, automotive break testing, and medical testing..instrument designed for all tests in industrial surroundings. Using the Centor technology, the digital torque gauge Centor Easy TT with reaction sensor has a very large graphic display and shows a maximum amount of information for more efficient torque measurement. Its rubber protection makes it a tool ideal for production conditions.